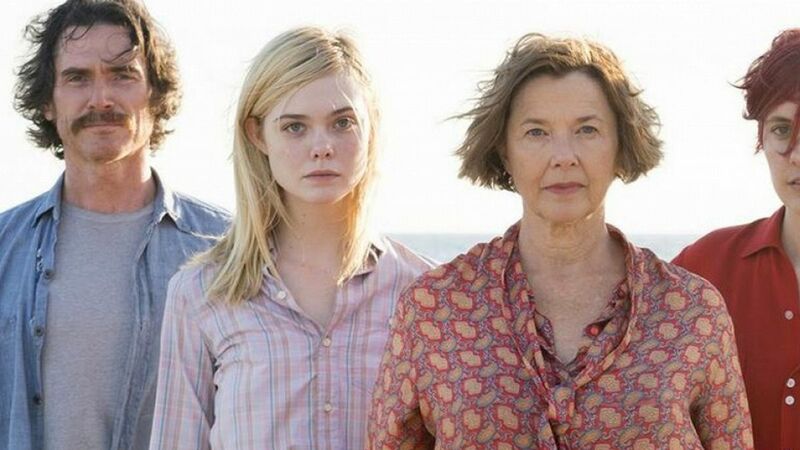 Mike Mill’s light drama 20th Century Women explores the ups and downs of a peculiar group of women (and men) in a highly idealised and nostalgic reconstruction of the 70s in Santa Barbara, California. 55-year old architect and separated mother Dorothea (Annette Bening) and her teenage son Jamie (Lucas Jade Zumann) live with arty lodger Abbie (Greta Gerwig) in a grandiose but derelict suburban mansion. The house is in dire need of repair and William (Billy Crudup) has been designated a resident handyman to see to the works, while Jamie’s best friend Julie (Elle Fanning) spends most of her time hanging around during the day and sneaking in during the night. More than a coming-of-age story about Jamie’s transition to adulthood, the film describes the slow process of Dorothea coming to terms with the fact that her only son is becoming an independent grown-up, at a time when drugs and punk rock are readily available and American society is going through a period of instability. The years of hippies and communes have gone by, the energy crisis has hit, the feminist movement is going strong, the punk subculture is questioning the establishment in a more radical and violent way than its peace-and-love seniors, Jimmy Carter shocks the country by talking about the aimlessness of the consumer’s society. So Dorothea is scared. Not just scared of losing a friend and a stock-monitoring companion, but scared of messing up his upbringing as a single mother. So rather than seek a man to balance his education, Dorothea asks the women around Jamie, Abbie and Julie, to look after him and keep him out of trouble. Obviously this doesn’t quite work to plan. Not so much because Jamie is having a hard time being a teenager. He is actually dealing with adolescence quite well, having fun with his mates, going out clubbing in L.A and so on. But more because Dorothea is finding it difficult to communicate her feelings. She wants to let go, but she is holding on tight. She keeps asking Jamie to talk to her, but every time he speaks his heart out, she takes offence and scolds him. She thinks she is the most open-minded person, but she grimaces at Abbie’s (heavy) mention of menstruation or Julie’s mother psychoanalytical theories rubbing off on her daughter. Strangely the story is told from the point of Dorothea, who keeps trying to convince herself that she understands everything that’s going on, that she knows it all, but despite all her good intentions, she is at a loss to understand Jamie, to really connect with him and with the times. With its heavy use of catchy tunes and Californian idyllic décor filled with lush palm groves, highways full of promises of freedom, paradise beaches, all filmed in saturated colours, Mill’s style is beautiful, but a little too polished and gimmicky, giving the film an anachronistic Instagram twist. And as with many American independent movies, there is an excessive focus on indoor scenes with characters dancing in their bedrooms on their own (or accompanied) and a lot of slow motion, zooming in and out. But the way Dorothea narrates the story with multiple flashbacks and fast-forwards while anchoring the story in 1979 is interesting. This gives Mill the opportunity to present each character’s past and future in a vignette style close to Wes Anderson or Jean-Pierre Jeunet. That’s how we learn much more about uncommunicative characters like ex-hippie mechanic turned builder William that we could have ever hoped. The slow pace of the film conveys the laidback atmosphere in California at the time and allows the viewer to get very familiar with each character, but the film does feel repetitive in some places with multiple scenes at home or at the same nightclub. Annette Bening’s interpretation of a loving but perplexed mother steels the show, but the supporting actors are very strong too, from Greta Gerwig’s cancer survivor photography artist Abbie to Lucas Jade Zumann’s Jamie, one of the most cool-headed 15 year-olds in L.A. and Elle Fanning’s pretty Julie who takes herself just a little bit too seriously, as teenagers often do. And even if it is sometimes overbearing the soundtrack is upbeat and uplifting, offering a mix of punk pop and jazz to highlight the generation gap, from Talking Heads to The Clash, David Bowie, Buzzcocks, Glenn Miller, Louis Armstrong, Siouxsie and the Banshees and much emphasised punk band Black Flag.